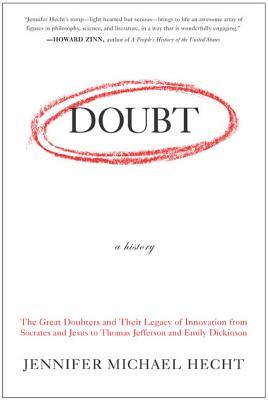 Jennifer Michael Hecht's 2003 history, Doubt, has become a favorite book of mine. Hecht's knowledge and smartness in connecting nearly three millennia of doubters is astounding. Worthy of note: Cultures defined by geography or time dispute. Independent thinkers from everywhere, and any era, using perception and reason tend to agree. This book caused me to acquire ten others. This remarkable book ranges from the early Greeks, Hebrew figures such as Job and Ecclesiastes, Eastern critical wisdom, Roman stoicism, Jesus as a man of doubt, Gnosticism and Christian mystics, medieval Islamic, Jewish and Christian skeptics, secularism, the rise of science, modern and contemporary critical thinkers such as Schopenhauer, Darwin, Marx, Freud, Nietzsche, the existentialists. Jennifer Michael Hecht is a philosopher, historian, and award-winning poet. She is the author of Doubt: A History and The End of the Soul; the latter won the Phi Beta Kappa Society's 2004 Ralph Waldo Emerson Award. Hecht's books of poetry include The Next Ancient World and Funny. She earned her Ph.D. in history from Columbia University and teaches at The New School in New York City.